Please visit support.ubi.com to start a Live Chat with a Support Agent or to submit a Webmail Request. Visit our FAQ page here. Download a step-by-step guide for installing either with the disc or without the disc. 1. Make sure your system is set to match your HDTV’s native resolution (1080p, 720p, etc.). 2. If your HDTV has a PC or Game Mode, select it. (For more information, check your HDTV’s manual). 3. If your HDTV does not have a PC or Game Mode, access your HDTV’s options menu, disable image scaling, and turn off all processing effects. A NOTE ABOUT HDMI: HDMI format carries both video and audio, but run the largest risk of producing audio latency. We never recommend using only an HDMI OUT connector to play Rocksmith 2014. 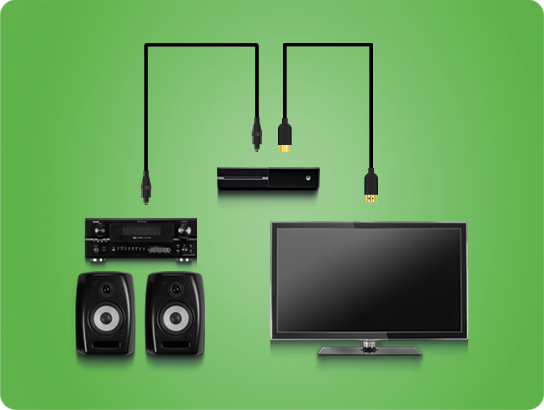 If your configuration is using only an HDMI OUT connector, consider using a separate cable to output the audio separately. A NOTE ABOUT OPTICAL AUDIO: We do not recommend using an optical output for playing Rocksmith® 2014 on Xbox 360 or PlayStation®3 system, as it can introduce additional latency when compared to those systems’ analog connections. Thanks to hardware and software improvements inherent to Xbox One and PlayStation®4 system, however, we do recommend using optical audio output on the most recent systems. Optimal Setup: The following diverts audio output separately, not through the HDTV. An HDMI cable alongside an optical audio cable: the optical audio carries audio to an external audio system (sound system receiver, headphones, computer speakers, etc.) separately while the HDMI cable carries video directly to the HDTV. It’s important to avoid running the audio signal through the HDTV. WARNING: Use optical audio to connect Xbox One directly to a separate sound system. 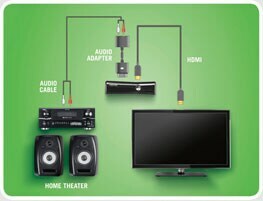 Using an optical audio connection from your HDTV to an external audio system may still result in audio latency as the audio signal is sent through the HDTV. WARNING: Use optical audio to connect PlayStation®4 system directly to a separate sound system. 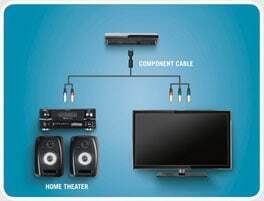 Using an optical audio connection from your HDTV to an external audio system may still result in audio latency as the audio signal is sent through the HDTV. 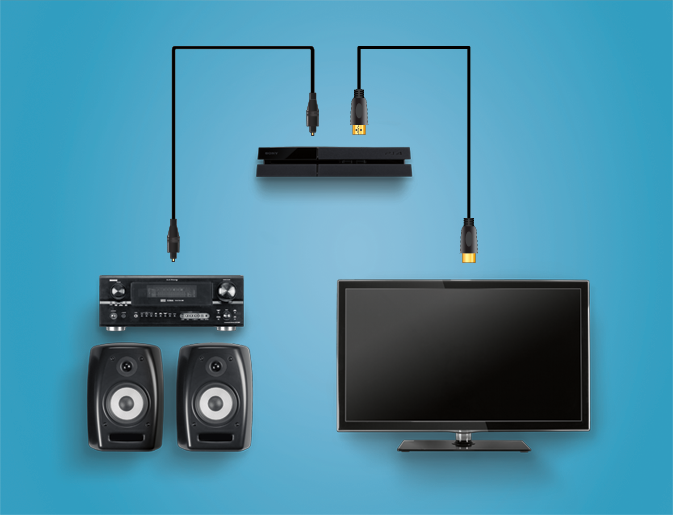 IDEAL SETUPS: The following examples divert the audio output separately, not through the HDTV. An HDMI OUT connector alongside an AV cable. 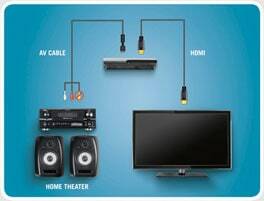 The AV cable carries audio to the sound system, while the HDMI OUT connector carries video directly to the HDTV. NOTE: This configuration may require an adjustment to your Xbox 360® system settings. This configuration uses a component AV cable only. The audio part of the component AV cable is routed directly to the audio receiver, and does NOT go through the HDTV. WARNING: Using the optical audio output method can add audio latency, and is not recommend. 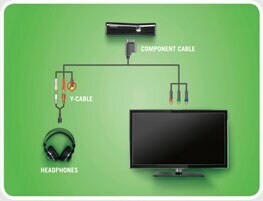 This configuration uses a component AV cable with headphones, connected using a Y-cable adapter. 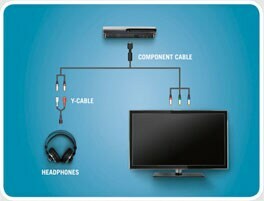 The audio portion of the component AV cable is routed directly to the headphones, and does NOT go through the HDTV. NOTE: Outputting the system’s audio through standard headphones will likely require an audio adapter (sold separately). NOTE: This configuration may require an adjustment to your Playstation®3 system settings. © 2013 Ubisoft Entertainment. All Rights Reserved. Rocksmith logo, Ubi.com, Ubisoft, and the Ubisoft logo are trademarks of Ubisoft Entertainment in the US and/or other countries. The “PS” Family logo and “PS3” are registered trademarks and the PlayStation Network logo is a trademark of Sony Computer Entertainment Inc. Software platform logo (TM and ©) EMA 2006.